Taiwanese have a long history of using traditional Chinese medicines. Following contemporary medicine technology development, the systems of TCM administration gradually evolved in separate areas. They include raw material, pharmaceutical quality control, development of into new drugs, Taiwan herbal pharmacopeia, and professional ability. The vision is to have a high quality TCM and services for the public. The quality control management of TCM materials has been implemented in three-stage plan since 1999. The first stage is to promote the package labeling of TCM materials. The label should include the product name, weight, manufacturer’s name and address, date of manufacture, expiration date (or shelf life), batch number, category, production region (country), storage method and use instruction. To set and to amend the abnormal substances limit of TCM materials are the focus of the second stage. These abnormal substances includes: heavy metals, aflatoxins, sulfur dioxide and pesticide residue are stipulated by reference to the several nations’ regulations for the safety of TCM materials. The goal of third stage is dedicated to completing the source management mechanism of TCM materials. This stage is focused on the inspection of imported TCM materials (Figure 3-1). Since 1 August, 2012, “The Inspection and Examination of Imported TCM materials” has started to be implemented on 10 TCM materials with large import quantity, such as jujube etc. Since 1 January, 2017, 21 TCM materials are required to follow this regulation of import inspection and examination. About 90% TCM materials are imported in Taiwan. The inspection system in customs could prevent unqualified TCM materials from entering into the Taiwanese markets and safeguard the interest of consumers using TCM materials. "The Inspection and Examination of Imported TCM Materials" has been implemented since 1 Aug, 2012. The top ten TCM materials with large import quantity are required for inspection. These TCM materials are Jujube, Astragalus Root, Angelica Sinensis, Liquorices, Rehmannia, Chuanxiong Rhizome, Poria, Peony Root, White Atractylodes Rhizome and Eucommia Ulmoides (Figure 3-2). The certificate of examination for the contaminants of TCM materials should be submitted at the import application for the above 10 TCM materials. In addition, 4 TCM materials (Jujube, Astragalus Root, Angelica Sinensis and Liquorices) are inspected in randomly-selected batches (Figure 3-3). For imported TCM materials that do not conform to regulations upon inspection will be shipped back or destroyed. Since 1 Jan, 2017, there are 21 kinds of TCM materials subject to imported inspection and examination and these TCM materials items are Jujube, Astragalus Root, Angelica Sinensis, Liquorices, Eucommiae Ulmoides, Poria, Chuanxiong Rhizome, White Atractylodes Rhizome, Peony Root, Rehmannia, Cinnamon Bark, Rhubarb, Pinellia Tuber, Twotooth Achyranthes Root, Bupleurum Root, Scutellaria Root, Ginseng Root, American Ginseng, Coptis Rhizome, Saposhnikovia Root and Tangerine Peel. By promoting TCM materials border control to prevent unqualified materials enter Taiwan, the safety of the usage of TCM is better protected. Since 26 October, 2006, TCM products are required to conduct heavy metal or other abnormal substances examination. Later, standard limits were set for abnormal substances in all TCM concentrated products after 1 July, 2013. According to “The Standard Limits for Toxic Substances for TCM Preparations” announced on 26 October, 2006, standard limitations on heavy metals for 5 kinds of single ingredient products, Liquorice Root, Gypsum, Fossilia Ossis Mastodi, Ginseng Root and Myrrh were established. In addition, “The Standard Limits of Abnormal Substances and Scope of Application” for 22 kinds of TCM formula products, such as “Tian Wang Buxin Dan” was established on 26 December, 2013. These 22 traditional product items should meet the standard limits of total heavy metals as well as individual limitations for lead, cadmium, mercury and arsenic after 1 July, 2014. Since 1970, our country requires that all TCM manufacturers must be licensed. The Central Authority of Health Administration undertakes a complete auditing system including factory inspection, review of documentation and field inspection. The licenses will be granted after their professional standards have been met. As of 2018, 94 GMP certified TCM factories in Taiwan and 22,745 TCM licenses have been granted. Half of these licenses are for physicians’ prescriptions, 8,384 licenses are for selling over the counter (OTC) medicine facilitating public purchases from pharmacy. A few licenses are for export (table 3-1, 3-2). This system is consistent with Western medicine administration. On July 31, 2017, “Regulations for Registration of Medicinal Products” was revised, where TCM stability testing should comply with TCM product stability testing standards announced by the central health authority, clearly specifying the tests required for each TCM product. TCM pharmaceuticals specifications and testing methods with all necessary items and contents are unambiguously stipulated in order to assure and improve the quality of TCM pharmaceuticals. When people research ancient well known medical records, it is common to see the same TCM formula name, but its prescription, ingredients and dosage are different. The same components with a different name can also be noted. Although the TCM industry is used to this situation, general consumers are unable to reconcile these discrepancies. The quality of TCM is difficult to be standardized due to this situation as well. The Ministry, industry and academia, have together studied and established basic standard formulae (prescriptions) together in order to foster TCM development and to increase the quality of TCM. The Ministry has announced 100 basic standard prescriptions such as "Liu Wei Di Huang Wan" on 31 August, 1995. Later on, the Ministry has announced further 100 basic standard prescriptions including "Sheng Yu Tang" on 29 June, 2000. In addition, the Ministry has announced further 22 basic Chinese medicine liquor standard prescriptions on 4 January, 2001. The industry should follow these prescriptions in order to assure and improve the standard and quality of medicine. In order to assure and improve the quality of TCM, 10 items of concentrated preparation have been announced on 24 July, 2000, including Ge Gen Tang, Xiao Qing Long Tang, Jia Wei Xiao Yao San, Gui Zhi Tang, Gan Ru Yin, Ma Xing Gan Shi Tang, Bu Zhong Yi Qi Tang, Liu Wei Di Huang Wan, Huang Lian Jie Du Tang and Du Huo Ji Sheng Tang. High-performance liquid chromatography (HPLC) should be used to quantify more than two index components in the concentrated preparation. This quality control is based on "The Notes of Quantitative Method and Standard" for concentrated preparation. In order to assure and improve the quality of TCM, another 10 items of concentrated preparation have been subjected to HPLC and have been announced on 23 December, 2002. The 10 concentrated preparation items are: Zhi Bai Di Huang Wan, Long Daw Xie Gan Tang, Xinyi Qing Fei Tang, Xue Fu Zhu Yu Tang, Qi Ju Di Huang Wan, Xiao Feng San, Qing Xin Lian Zi Yin, Si Ni San, Ding Chuan Tang and Chai Ge Jie Ji Tang. The GMP (Good Manufacturing Practices) system was implemented on TCM pharmaceutical factories in Taiwan since March 1, 2005. As of December 2017, there were 94 GMP accredited TCM pharmaceutical factories in Taiwan (Figure 3-4). Based on Article 8 in the “Regulations of Medicament Manufacturer Inspection”, the Ministry regularly carries out follow up inspections for TCM pharmaceutical factories every 2 years. In addition, if deemed necessary or any significant drug harm is noticed, a random inspection mechanism will be initiated. In order to assist TCM pharmaceutical factories to keep abreast of international regulations on quality assurance, the Ministry has proactively helped TCM pharmaceutical factories to establish validation capability since 2016 to facilitate the marketing of premium TCM products to international markets. The Ministry strongly encourages and highly supports an environment for developing TCM-based new drugs. 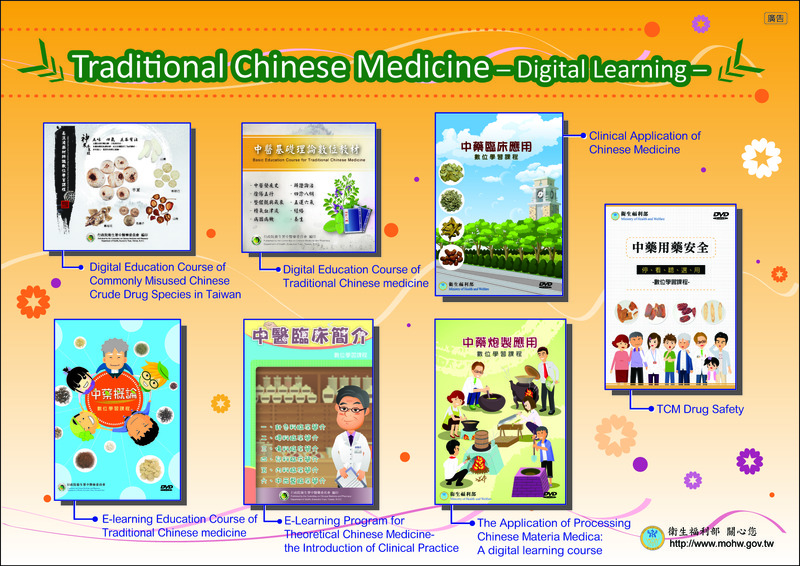 Owing to the uniqueness of TCM, the Ministry encourages cooperative research and development from the industry, government and academia, promotes biotechnology, and keeps the industry updated and responds to international regulation updates according to the “Guidelines on Examination and Registration for New Chinese Medicines” as announced on October 20, 1999. It helps the industry to follow the process, when they apply for license of TCM-based new drugs. Eighteen clinical experiment centers have been established in order to provide the experimental environment for TCM-based new drugs (Figure 3-5). The Ministry assisted the Medical Research Ethics Foundation to establish the "Joint Institutional Review Board for Traditional Chinese Medicine" in order to set up a clinical experiment inspection mechanism, to inspect clinical experiment cases and to promote education in 2006. "The Standards of Clinical Experiment for TCM-based New Drugs” was announced in 2008. The Ministry has accepted 23 domestic new research applications to new investigational drugs (IND) from 1999. "LipoCol Forte" and "Chemo Young Oral Solution" were granted new drug licenses after completing the whole process based on international new drug investigation guidelines. "LipCol Forte" was granted TCM license in 2005 (DOH-PM-047152), which was red yeast extract (Figure 3-6). "Chemo Young Oral Solution" was granted TCM license in 2011 (DOH-OM-015926), which was organic fermented soybean solution (Figure 3-7). The issue of the license for new drugs showed that the biotechnology industry has the ability to research new drugs of TCM, and also indicated that the quality of TCM could be inspected according to contemporary scientific methods. Taiwan relies on imports mostly for a variety of commercially available TCM materials. In order to establish a system of quality control for TCM materials and ensure safe medicine for the public, the Ministry officially announced the first herbal pharmacopeia "Republic of China’s Herbal Pharmacopeia" on 9 March, 2004. (The book was renamed "Taiwan Traditional Herbal Pharmacopeia" on 31 August, 2005). The second edition named "Taiwan Herbal Pharmacopeia" was published on 22 December, 2012. (Figure 3-8). The pharmacopeia has collated 300 TCM material items. All raw materials of TCM have to meet the regulation of the Taiwan Herbal Pharmacopeia in the second edition. It helps to increase the quality of TCM in our country and also ensures medication safety for the public. In order to enhance the edition of Taiwan Herbal Pharmacopeia, the Taiwan Herbal Pharmacopeia Editing Committee was formed in 2015, consisting of 4 working parties based on aspects such as the origin of Source, TCM Assay, TCM Preparation, and Clinical Chinese Medicine. The teams are responsible for promoting the carrying out of the revision of the herbal pharmacopeia. 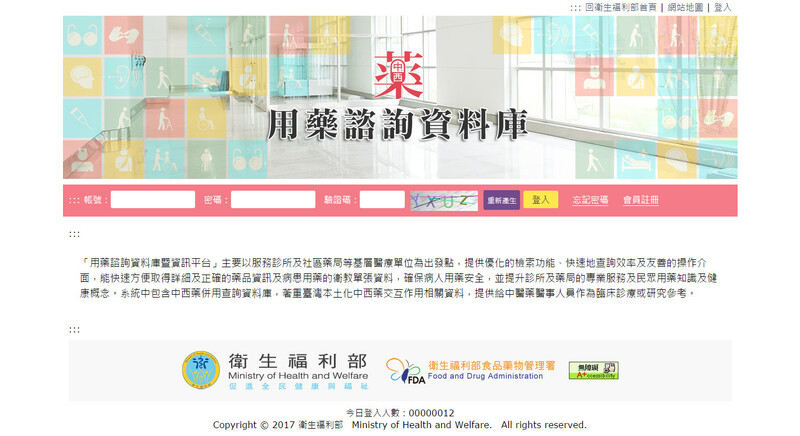 In 2016, the Taiwan Herbal Pharmacopeia online Database (https://www.cmdhi.mohw.gov.tw/dhi/index) was created (Figure 3-9), and an English version CD for the second edition of Taiwan Herbal Pharmacopeia was published, in order to facilitate the internationalization of Taiwan Herbal Pharmacopeia. It can be the reference for international experts, scholars, and TCM product exporters. The aim is to strengthen the international influence of Taiwan Herbal Pharmacopeia. The third edition of Taiwan Herbal Pharmacopeia is expected to be published in October 2018, incorporating 55 new TCM material items, bringing the total to 355 items. This book features a collection of TCM materials that can be found in Taiwan, and it has stipulated 2 TCM concentration preparations, and adopted new developments in green chemistry analytical methods. After validation experiment, they will be incorporated into future revisions of Taiwan Herbal Pharmacopeia, where scientific, systematic methods are applied to enhance quality control and regulations of TCM materials, thereby fostering the internationalization of TCM in Taiwan, as well as facilitating developments in TCM industry. "Color Illustrations of Herbs" was published in 2009 to coordinate with the compilation of “Taiwan Herbal Pharmacopeia”. The illustration was a collection of the 250 TCMs, including original animal/plant forms, original medicine properties, shapes, and traits as a complete reference illustration. "Taiwan Herbal Pharmacopeia Illustration Editing Team" was founded in 2013 in order to synchronize updates of the content of color illustrations of herbs (figure 3-10). The illustration is a reference for the public. Furthermore, it increases the ability of TCM practitioners and the public to identify TCM materials. As a result, the possibility of TCM materials misuse will be reduced. Chinese medicine dealers engaged in wholesale, retail, import and export business. By 2017, there are 10,157 certificated Chinese medicine dealers in Taiwan. Among them, there are 1,210 dealers who are full-time resident pharmacists, assistant pharmacists or Chinese medicine physicians; there are 8,947 dealers who recieved a certificate of Chinese medicine dealer by the article 103 of Pharmaceutical Affairs Act; on the other hand, there are 3,851 pharmacies concurrently registrated as dealers engaged in Chinese medicine retail. In recent years, the Ministry has cooperated with industry and academia to conduct several personnel workshops, including professional training for Chinese medicine quality control personnel in TCM pharmaceutical factories, personnel training for identifying easy-misrecognized TCM materials, personnel training for TCM material inspection and personnel training for TCM dealers etc. (figure 3-11). All the efforts focus on continuously reinforcing the concepts of TCM quality among manufacturers and venders. The correct rate of TCM manufacturing raw materials increases to 95% in 2012 from 71% in 2007 in registered TCM pharmaceutical factories. The result shows that continual professional education and assessments promote the professional abilities of TCM practitioners and improve the quality of TCM products further. 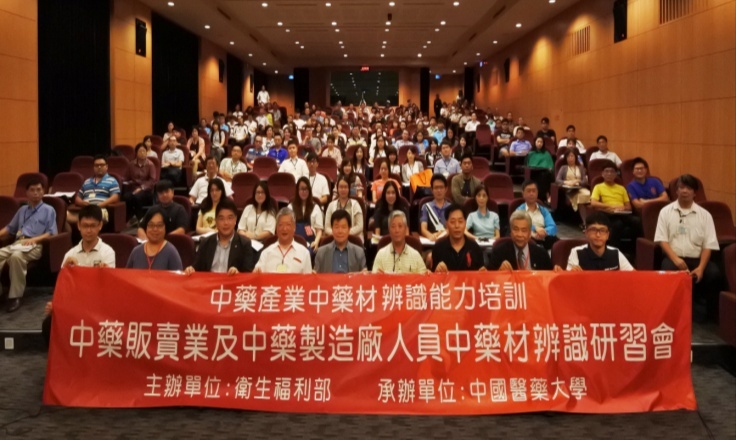 The implementation of National Health Insurance (NHI) in Taiwan covers TCM and Western medicine. The public often takes Western medicine and TCM together and the interactions between the two are receiving increasing attention among health communities. The Ministry advocated the studies of the interactions between Western medicine and TCM since 1999, in order to ensure the safety of medication for the public. A drug herb interaction database was set up in 2014, and general surveys of drug herb interactions as well as relevant studies and investigation in clinical practice have been conducted. The database will help the public to understand and manage the avoidable risk and ensure clinical benefits regarding the timing and concurrent use of Western medicine and TCM. Scientific data for the toxicity and effect of Western medicine and TCM interactions can be obtained through evidence-based medicine, scientific theory, and case analysis. The Drug Herb Interaction Database was officially posted online in 2017 (Figure 3-12), boasting a collection of 3,085 entries on drug herb interaction research, 556 entries on drug herb polypharmacy and pairing and 475 entries on TCM literature and TCM incompatibility. 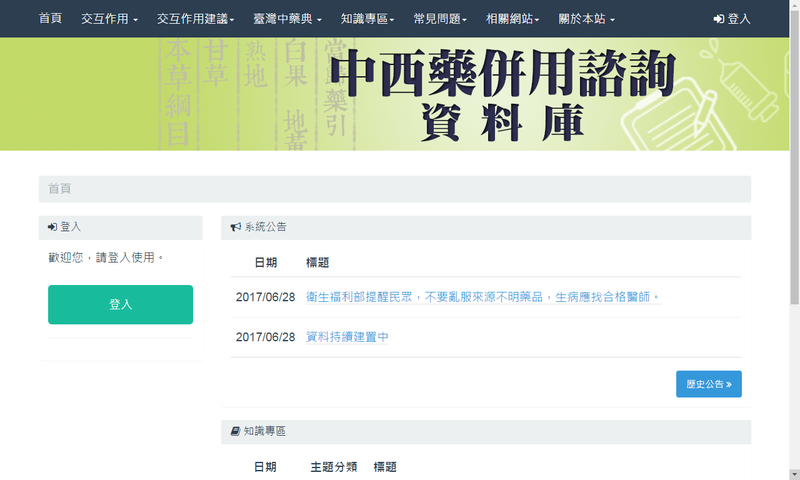 The system is connected to the Taiwan Herbal Pharmacopeia Online Database and TCM License Inquiry System, to providing access for both clinicians and researchers. 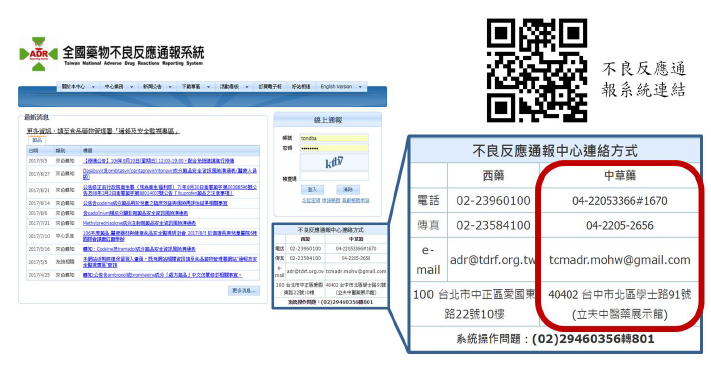 Moreover, it has been integrated with Food and Drug Administration, MOHW to form the “Drug Information Database” (https://mcp.fda.gov.tw/) (Figure 3-13). The platform’s interface has been refined by augmenting search interfaces for the general public and medical professionals in order to cater to the specialized needs of different groups. The Ministry set up a reporting system for TCM adverse drug reactions in 2001, to improve the safety of TCM for the public. Since then more than 2,256 cases of adverse drug reactions to TCM have been reported by the end of 2017. A risk management mechanism of TCM was established by a professional investigative team that carried out analysis assessments on related information. The integration of a reporting mechanism for adverse reactions to Western medicine and TCM was achieved in 2016 (figure 3-14). This mechanism will make it more convenient for and assist healthcare facilities and healthcare practitioners to speed up the reporting process. It should also improve information dissemination and health education.